What is it about the Black Nazarene that moves millions of Filipino Catholics to gravitate to it? This said to be miraculous image of Jesus Christ has blessed the lives of the devotees, but we should not hide the fact that it also claimed lives during the crowded procession. But who are we to doubt what millions of people believe. Even at this day, there seems to be a multitude of believers who would literally die for offering their praises towards their beloved God. Faith is indeed something great to hold on to as it gives many people strength and hope for a better tomorrow. But as they say "Nasa Diyos and Awa, Nasa Tao ang Gawa." We should therefore also exert extra effort to work on our dreams and aspirations, and not rely on a miracle. Praying to win in the Lotto is totally wrong. Praying to get a job without investing on learnings appropriate skills will get you nowhere. We all have to work hard, or smart, to get what we want. 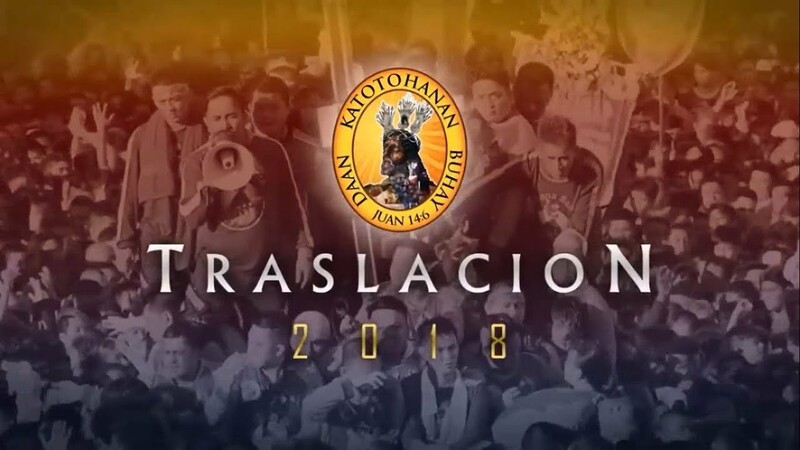 The Manila Police District (MPD) will be fielding more or less 5000 policemen and augmentation for the safe conduct of the Traslacion 2018 and security of devotees who will participate on January 9. A Quiapo Church rector also said that organizers will be setting up 12 prayer stations along the procession route - an effort to give other devotees another option aside from joining the procession. Classes in all levels for both private and public schools and work in government offices in Manila are suspended on January 9 in observance of Traslacion 2018. Several roads will also be closed as early as Sunday from 1 p.m. onwards. Due to safety considerations, new route will be implemented for Traslacion 2018, veering away from the Lagusnilad: from Manila Hotel proceed to Katigbak drive to pass thru Intramuros to NPC to Jones Bridge then same route as to the previous years will be followed. Aside from the signal jammers to prevent usage of mobile phones, a 48-hour gun ban will be implemented in the city from 12mn of Jan 8 to 12mn of Jan 10 as an security measure. There is no actual, direct or imminent threat reported. As usual, it is expected that Manila will be a very busy day so it is advisable for commuters to avoid passing through the areas where the Traslacion is held. Pregnant women, children, elderly, sick and disabled or handicapped, are discouraged to attend since even the strongest man could be trampled upon by the over-eager crowd all wanting their share of the blessings. We believe that God will grant our wishes even if we are miles away from the image of the Black Nazarene, or any other saint and church. We should not be required to actually be present at religious places to receive the blessings of the Lord. As we all believe, God is omnipresent and thus is everywhere. He is omnipotent which makes him capable enough to whatever he desires. God gave us the free will to choose and decide for ourselves, so there is no wrong choice or decision, and that includes standing up to what we believe in. What is wrong is to give in to what the majority dictates in spite of our personal disbelief. We see Science and technology slowly enlightening us but there are still many questions left unanswered. We believe it will be a never-ending quest for answers as there are just too many wonders in this world. Life alone is a miracle that still has many intricate complexities. We are forever a continuous story, and though we could not make it as perfect as we hoped for, the effort to go through life believing, or not, still serves many purpose for those who have gone through life loving others unconditionally. Our fervent hope is for the devotees to spread their love not only towards the Black Nazarene, but to others as well. It is such a disappointment seeing religious people participating in the Traslacion and other similar activities but are perpetrators of unethical acts. Sadly, some just want to be seen for publicity - and this is not limited to the celebrities or politicians.